WASHINGTON, D.C. (Legal Newsline) – Trial lawyers will spend almost $900 million this year in broadcast advertising, a new report projects, with a firm that allegedly recently took in more than $90 million in funding to purchase lawsuits leading the way. The report, written by University of San Francisco professor Ken Goldstein and Dhavan Shah of Sherpa Metrix, was prepared for the U.S. Chamber Institute for Legal Reform’s annual summit, held Tuesday. Goldstein and Shah’s research showed that broadcast advertising has grown by 68 percent over the past eight years, from $531 million in 2008 to a projected $892 million in 2015. “(L)egal advertising not only appears to be recession-proof, but also politics-proof,” the report says. Goldstein and Shah project that AkinMears of Houston will spend more than $25 million this year. They reached that figure by obtaining the amount the firm has already spent this year, as of Sept. 30, and prorating it to the end of the year. 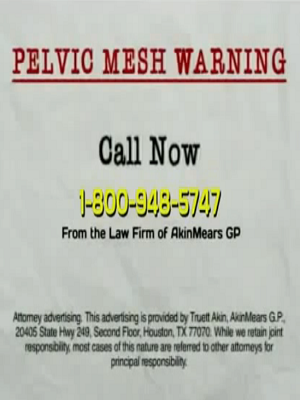 A lawsuit recently filed against the firm said it obtained $93 million in financing to purchase 14,000 pelvic mesh lawsuits. Following closely behind AkinMears in TV spending is Morgan & Morgan and the Houston firm Pulaski & Middleman. The others in the top 10 in TV spending are Legalzoom.com; James Sokolove Law Firm; Goldwater Law Firm; Los Defensores Attorney; Avvo; Jim S. Adler; and Cellino & Barnes. The Tampa, Fla., market has seen the most legal ads this year with more than 164,000. It is followed by Orlando, Fla.; Atlanta; Las Vegas; Milwaukee; Detroit, Louisville, Ky.; Birmingham, Ala.; Mobile, Ala.; and Houston. The four categories seeing the most spending are prescription drugs ($57.3 million), medical devices ($45.7 million), asbestos ($45.6 million) and lawsuit funding ($39.6 million). The report also studied trial lawyers’ efforts to promote their websites. Seventy-eight of the top 100 Google search terms were legal terms, according to WebpageFX and SemRush. A firm that would want a higher place for its ad on the Google search “San Antonio car wreck attorney” would need to spend more money than any other legal search term, the report showed. The ILR owns Legal Newsline. From Legal Newsline: Reach editor John O’Brien at jobrienwv@gmail.com.